Like orchids, staghorn ferns (from the genus platycerium) were once considered exceedingly difficult, but are now fairly common. There are 17 species of platycerium, but only one (the bifurcatum) is truly common. These ferns are epiphytic, which means they grow mounted on plaques or other substrates. They have two distinct leaf forms. Small, flat leaves cover the root structure and take up water and nutrients. Green, pronged fronds emerge from this base. These fronds can reach 3 feet in length. In certain circles, platycerium varieties are intensely sought-after collector's plants. Light: Bright light, but not direct sunlight. They can handle more sunlight given enough water, warmth, and humidity. Water: Water regularly throughout the growing season. Perfect drainage is essential; plants do best when mounted on plaques. Increase water as temperature rises. Temperature: The most common staghorn can survive briefly freezing temperatures, but they thrive in warm, humid conditions. Soil: Young plants are potted in rich, well-drained compost. Mature plants should be mounted. Fertilizer: Feed during the growing season with weak fertilizer weekly, or throw a few slow-release pellets in the center of the plant. By spore or division. Large platycerium can be easily divided into smaller plants, and even small "chunks" that include a leaf and a bit of root ball can be potted individually. Make sure new divisions are kept warm and moist until they are growing independently. Don't get discouraged if newly cut divisions take a little time to root, or if it takes a few tries. Propagating ferns takes some practice, and even experienced gardeners don't always find it easy. Small platycerium are frequently grown in pots in a loose potting mix with perfect drainage. However, these plants are natural epiphytes. In spring, they can be attached to a plaque or piece of bark with a few wraps of pantyhose or even glue. Wrap the roots in moss to retain moisture. Alternatively, they can be potted in hanging baskets. They will eventually grow through the basket lining and form a ball. Mounted plants should not be disturbed, except to take pieces for propagation. 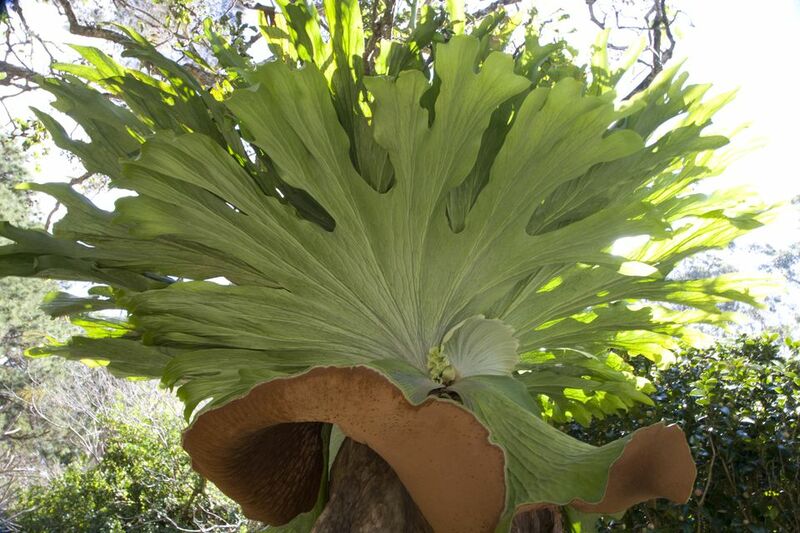 The most common staghorn fern is platycerium bifurcatum. There are countless varieties of P. bifurcatum, including many with interesting leaf forms. Another species, P. grande, is sometimes called the elkhorn fern. This plant features very large solid fronds up to 5 feet in length. Additionally, there are several collectors' species available, such as P. willinckii and P. superbum. These are quite rare, however, and often grow larger than most indoor growers can accommodate. Significant confusion surrounds the naming of several varieties, and they may appear in garden centers under different common names. The P. bifurcatum is native to Australia. Because this is by far the most common staghorn fern, most growers don't need to worry about the more specific growing conditions suited to exotic varieties. The chief concern with these plants indoors is humidity: they should be misted frequently and given ample ambient humidity during the warm growing season. They are more tolerant of cold than many people expect, and larger plants can withstand fairly long periods without water. Don't remove brown, flat leaves at the base of the plant—these are essential. Overall, these are not especially difficult to grow. Make sure to maintain a good balance of factors, since ultimately growing these plants comes down to ensuring that they're not exposed to extreme conditions.